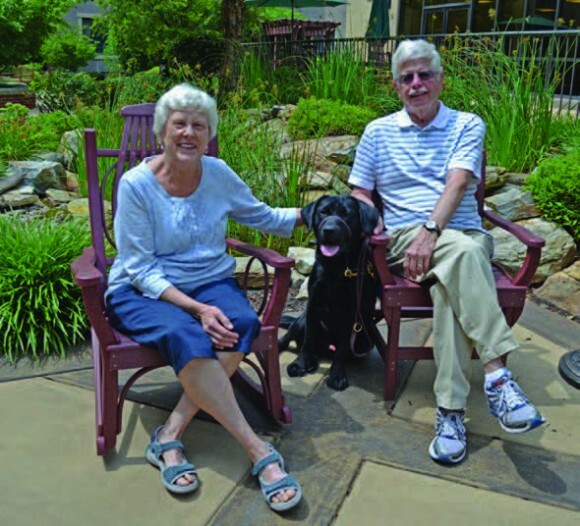 Bill and Carol believe in the healing power of a dog because they’ve seen it firsthand. They’ve witnessed the impact of therapy dogs on hospital patients and their families, and they’ve seen the impact of service dogs for those with disabilities. Before retiring, the Morlings were quite active in their church. But, when they moved to a retirement community, the distance made it difficult to participate as they had before. Fortunately, a neighbor in their retirement community introduced them to a new organization which could speak to their hearts and passion. After witnessing the love and care they gave to their dog, Dr. Charles Raker, a respected veterinarian in his community, told them about Canine Partners for Life. The rest, as they say, is history. Bill and Carol dedicated themselves to volunteering their time, talent, and treasure to CPL right away. Bill moved quickly through his dog handling training. He started as a Cuddle Time volunteer and then began walking the dogs in formal training in just a few short months. Each week, staff and volunteers can see him walking dogs bright and early each Monday morning. He also loves to “puppy sit” when there are new litters of puppies in the CPL Breeding Program. Following some back injuries, Carol recognized that walking dogs wasn’t the best option for her, so she decided to help with various administrative tasks in the office. 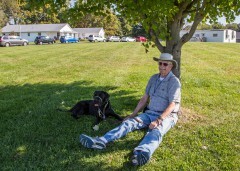 Though they are generous donors and volunteers, Bill and Carol agree, “we get more out of it than we give.” Bill says, “Working with the dogs and the staff are reward enough. I’ve learned the value of patience working with the CPL dogs and volunteers.” One of Bill and Carol’s favorite things about volunteering with CPL is attending the graduation ceremonies. Bill especially enjoys seeing the maturity and growth in the dogs’ personalities from the time they enter CPL’s kennel around 14 months to the time they graduate at about two years old. Although they value their status as volunteers more than their status as donors, Bill and Carol give generously to CPL as members of our Independence Society. They even covered the costs for two staff members to attend the 2016 AKC Canines for Excellence ceremony in Orlando, FL when CPL’s service dog, Teddie, won the AKC Service Dog of the Year award. They appreciate the opportunity to increase awareness for the organization. The Morlings have such a passion for the mission of CPL they’ve made the decision to leave a legacy when they are no longer able to volunteer. Bill and Carol have joined Solla’s Partners, CPL’s planned giving society, by remembering CPL in their estate plans. At Canine Partners for Life, we are grateful for each and every one of our volunteers. CPL would not be able to achieve its mission and increase the independence and quality of life for individuals with disabilities without the help of dedicated volunteers and donors like Bill and Carol. We currently have more than 500 volunteers who make our mission possible. Volunteer roles include community puppy homes, temporary puppy homes, cuddle time volunteers, walking volunteers, weekend dog sitters, socialization handlers, and more. If you are interested in becoming a volunteer for CPL, please visit www​.k94life​.org/​v​o​l​u​n​t​eer.